And Tiger’s been treating me! Now: the Hierophant represents the search for knowledge and illumination, the desire to study creed and dogma instead of simply accepting them, to research and achieve further development. It also stands for the deep fulfillment someone can find when really trusting their own beliefs. This scribble was published on Monday, November 7th, 2011. You can follow any banter on this scribble with the RSS 2.0 feed. You can share your inspired musings after typing the anti spam word near the bottom of the page. But no Pinging because its too naughty. Happy Birthday Wendy, I’m sure the future will see to it that your 8 cups runneth over. I love the idea of stacked cups in a champaigne fountain – awesome – thanks Bux! Have a good one (or hope you had a good one). I think you are the same age as Johnny Depp. But I’m not sure if this means anything. Happy Birthday, Wendy! Have a great one! 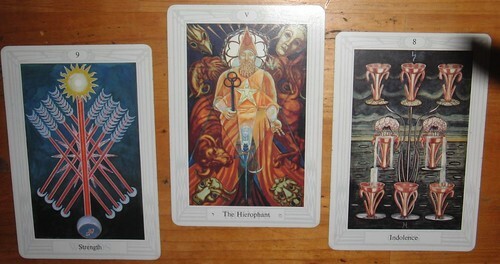 Oh, and I don’t believe any of this Tarot rubbish. But apparently that is typical of us Leos.